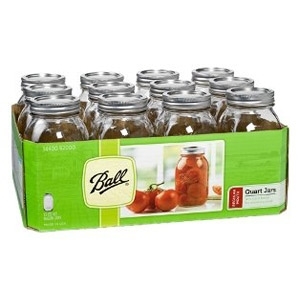 Preserve your own foods, save money, and feed your family wholesome and nutritious sauces, stewed tomatoes, pickles, and delicious jams with these 16 ounce jars from Ball. These iconic canning jars feature a solid glass construction, metal lids, and are embossed with the Ball logo. Canned foods also make thoughtful gifts for friends. Feel a sense of pride in knowing that your family is eating wholesome foods. Or use the jars for drinking glasses, pencil holders - anything you can think of.